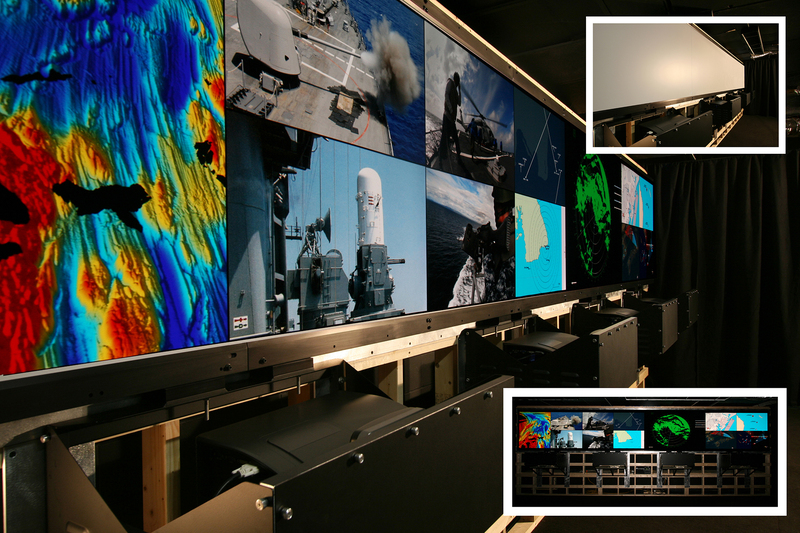 The VDCDS 32- and 42- inch MMD Systems provide a state-of-the-art command and control and situational awareness display capability in a fully ruggedized package. 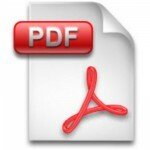 The MMD System is designed for foundation mounting in Aegis class ships. 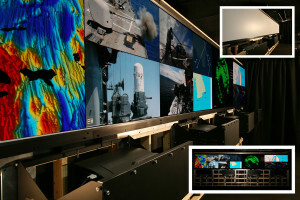 Each MMD System connects directly to the DiVDS video system, which provides a composite of 4 High Definition (HD) signals, and displays a single seamless image across a rigid Screen Panel system. In order to create this single seamless image, the system utilizes a pair of Power of Ethernet (PoE) feedback Calibration Sensors and specialized software to calibrate the imaging system. Finally, the MMD System provides a power interface module with conditioning and overload protection. The MMD System projection core uses a Texas Instruments (TI) Digital Light Processing (DLP) light chip for image generation. This chip uses micro-mirrors to turn each display pixel on or off. Mirror movement is coordinated with the illumination of each light color source (red, blue and green). This eliminates the need for a color wheel. Each color source is cycled several times each frame, to eliminate the rainbow effect sometimes created by single chip DLP systems. The MMD System receives its video signal from the DiVDS video server via a Gigabit Ethernet connection. 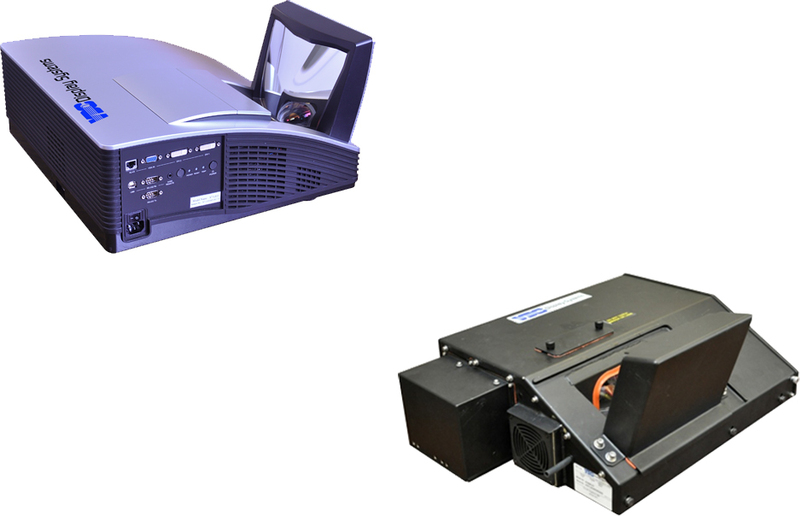 The VDCDS software then parses the video stream into four separate video channels, puts the resulting image streams through a blending and warping transform and sends the appropriate feed to each of the four Projectors. The Projectors core automatically detects the format of the receiving video signal and displays the image onto the Screen Panel. In addition to video processing, the VDCDS software provides a Simple Network Management Protocol (SNMP) interface to provide system status information to the Operational Readiness Tracking System. (ORTS). Video is transmitted from the Image Processing Server via active (DVI) to Optical Fiber encoders, and then received and decoded at the Projectors via active Fiber-to-DVI decoders. Once video is decoded at the Projector, the projected image exits the Aspheric Projection Lens, is folded by the integrated mirror, and reflected on the front projection, aluminum honeycomb display Screen Panel. Minor changes in image size and the left-right and up-down locations are achieved by making adjustments to the 6 Degrees of Freedom (6DoF)MountAssembly, which is then locked down to avoid the effects of ship vibration. Gross changes to a project's position are accomplished by relocating the 6DoFMountAssemblyvia extra bolting locations on the mounting structure base plate. The VDCDS Multi-Mission Display (MMD) Driver Package (MMD-DP) is a software mechanism for graphics rendering that supports in situ image processing operations such as, but not limited to, geometry correction, image stitching and edge blending between multiple projectors. The MMD-DP presents a single desktop to the Operating System (OS) which contains the entire pixel space of the combined Projectors. The MMD System's available resolution is the composite pixel space of all attached Projectors less those pixels used for image processing.